I'm working on this map right now. Is this map realistic/believable? The continent would be about 5 million km² and lies in the temperate climate zone. (I intended it to be smaller than Australia; my numbers might be off.) . The island would be the only empire, the rest would be city-states. Caellan, Aerigoth and Roymoi are home of barbarian tribes. There is some volcanic activity (not significant). The Wyvern Mountains are inspired by the Andes. And are the names okay? I always struggle with names of cities, locations and so on. I hope I got the tags right. I get no sense of scale from the map, so can't really speak as to believability. In other words, it could be a map of a continent, or it could be a map of an island the size of Cyprus. A scale (i.e., how many miles per inch) would be very helpful. Taking up two corners with cartouches showing the two hemispheres of the planet will help us get a perspective for the size of this land as compared to the other land masses and also as compared to the planet itself. Aesthetically, I find the land shapes pleasing; but not the inky colour of the sea. The work as a whole appears very dark. For example, I can't even see the little wave patterns unless I increase magnification. They would be more obvious if the background colour were lighter. It looks like every other computer generated fantasy map out there. This isn't a bad thing! That's what the market seems to prefer and it's what the many map making applications provide. If that's the style you're going for, then I'd say you're well on your way! Though you might consider some kind of faux-Greek knotwork border and huge cartouche that says "MAP OF XYZ-LANDIA"! Because that seems to be de rigeur in modern computer generated fantasy maps. 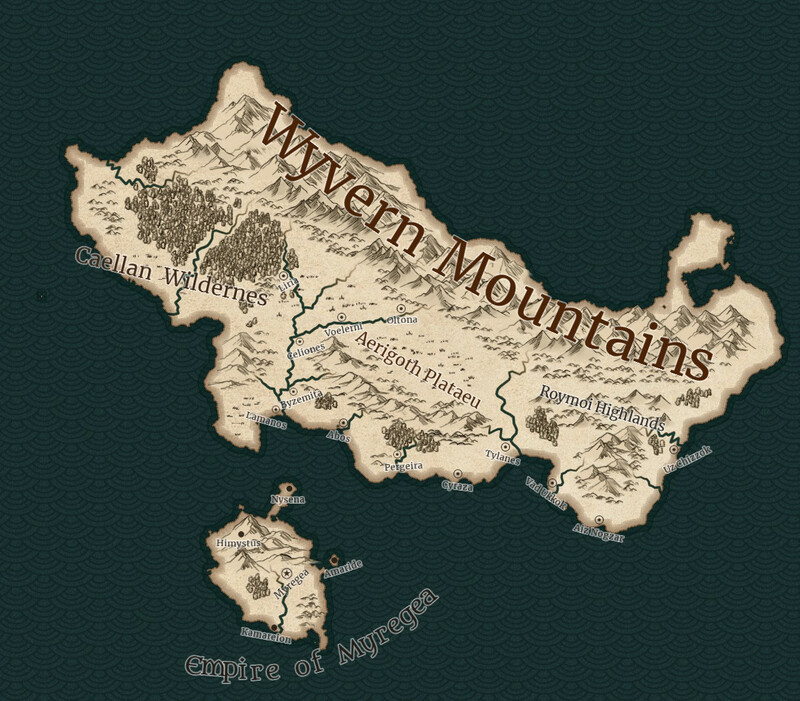 "Wyvern Mountains" should be in a MUCH SMALLER font! If this is a map of a continent, probably all the lettering is too large. Lettering, ideally, should not stick out into the ocean (Caellan Wilderness, I'm looking at you!). Smaller letters, curving around the southern side of the woodlands I think would look better. Also, mind the typo! Are you trying for a Greek-like sound in the city names? If that was deliberate, kudos! That's the general sense I got from the names. And then there's Uzchizaak. (Bless you!) Kind of looks like you stuck Klingon onto the side of Achaia! Are the people of those cities of a different race / ethnicity than the quasi-Greeks? Since you asked specifically about the names, I'd say they "fit" together pretty well into two distinct cultural & linguistic groups: the three cities towards the right side being one; and everything else being the other. The names seem to me well crafted and pleasing to ear & eye. Is this whole continent part of the Empire of Myregea? If so, that fact is not apparent from the placement of the country's name. If so, that name should be in nice large letters! Are the folk of those three nearly vowelless cities part of the Empire? If not, some political boundaries might be in order. Roads, at the very least, would be helpful, as would provincial names. Basic cartographic apparatus will also be helpful: a scale and compass rose or lotus of the winds at the least. If there are to be any "tourist sites" like ruins or temples of some mad god-king or gates to Hades, those should be marked. A cartouche defining any symbols you use on the map will also be a great help. 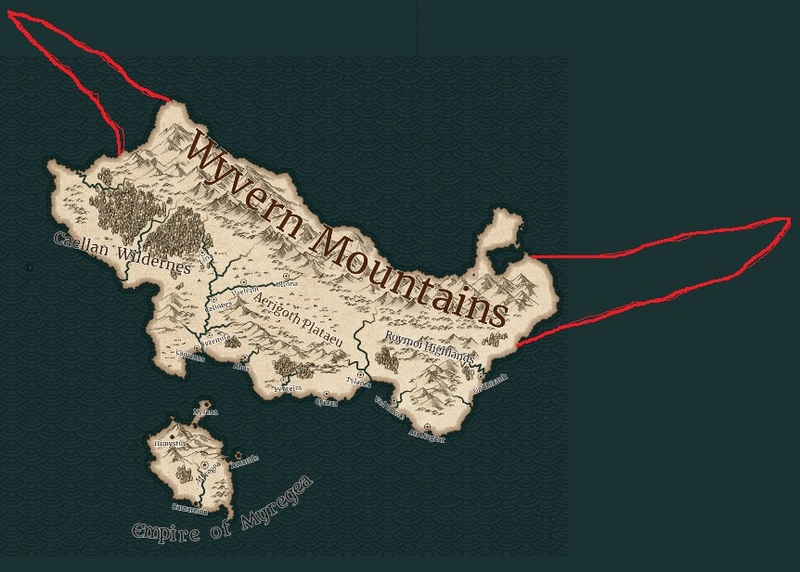 The more I look at the map, the more I dislike the name "Wyvern Mountains". This seems to me the odd name out: it lacks the same "Greek" feel to it. Ophidion Mountains gives the same sense as wyvern, but using a Greek root. But that's really a matter of personal taste. West of the Wilderness, there is a little dark square with a dot in the middle. Is that an error, or is that your world's answer to Rockall? I find your map to be a realistic and believable computer generated fantasy map. I'm not a geologist, but I don't see any egregious errors that can't be handwaved away because it's fantasy. In fact, I'd say it is actually very nicely composed and with a couple minor additions, corrections and some judicious decoration would look very nice folded up in a computer game or rpg box or reproduced in a novel or world compendium. Is it realistic, maybe. I'm not a Geologist so I can only speak from observations of maps and some online research, Elemtilas' breakdown is very good but I'd just wanted to add to it. Understand that artistic license was heavily used in the past in terms of map making, for example the below picture illustrates The difference between a medieval map of the English coast around the important harbour of Plymouth, and compared next to it is the real life google maps image of Plymouth. The Old Maps are there to offer details of the town as well as possible landing and mooring regions for an enemy invading force, and scale is not as important in the less tactically significant areas. Whereas after the invention of newer map making technology, a Theodolite allowed them to make very accurate measurements. These older maps that showed mostly defensive information became obsolete. It depends on in what timeline these maps were made. if it were the older style then as a basic map of the entire continent then its ok. Not perfect, but ok. Your map looks like it came from an online generator, where you plan out the shape and basic terrain features then add names and notes. The issue with those generators is that the don't do coastline very well. The features of your map appear to be in the classical- fantasy style in terms of mountains and forests. However the coastline is not, cliffs etc should be more pronounced on a map of this style, irrespective of scale. Please understand I'm not criticizing the use of the online generators, they work well enough in general, and realistic looking maps are very very hard to achieve. I've tried numerous times and they still look worse than the online generated ones. Aside from the points here, the other answers have you covered, so I won't repeat the answers of other users. I haven't personally found any decent and free software to help you create them, but have had moderate success (at least compared to my other attempts) with layering in Photoshop to build up contour lines, but it is a long long process. Based on your answer above (bear in mind I am neither a geologist nor cartographer), and considering several factors such as the climate and land size (approx. 2.6m sqm less than Australia in comparison), you may want to put in a bit more variation on it. Variation such as more forests, swamps etc. Your central landmass area seems to be dry with just a few rivers going inland. If it is deliberate then it's fine, but a lake or two may be more desirable and sensible. Better than many maps I've seen. Overall it lacks detail. What makes the wilderness, wilderness? You have towns on the plateau, but not in the forest. Is there a difference in soils? Drainage map is incomplete. Look at a map of rivers of real landscapes. Your story work will be helped by overlaying a geological map. This will give you locations of mine sites. You've done the right thing to put towns at major junctions of rivers, and at locations where rivers meet the sea. Historically towns will also occur where transportation modes change -- the camel caravan route meets the river. Smaller towns at places people have to wait: Each side of a pass that is snow covered in winter. Give thoughts to resource management. Britain put the broad arrow on any white pine in New England that was taller than 160 feet, reserving it for the King's Navy. Take a close look at your society and culture, and ask what do they use, and how do they make it. 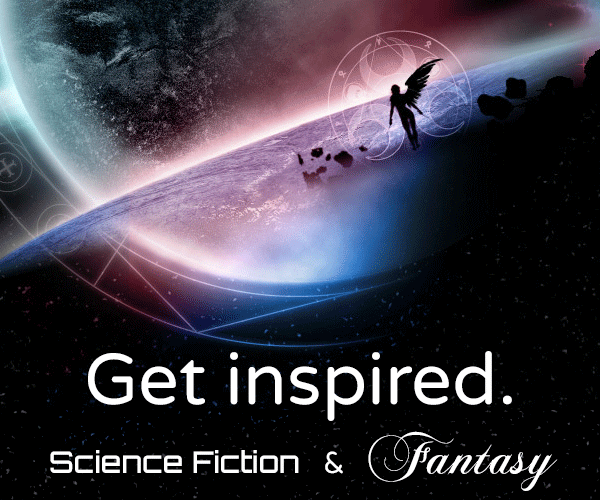 This creates 'fantasy with rivets' A ton of this detail doesn't make it into your book/game, but it's existence makes what you do reveal self consistent. If you have potters, you need fuel to fire their wares. I remember a time when reading about a horse and camel powered city in the middle of a barren desert. Doesn't happen. No food. You need climate too. Which way does the wind blow? Australia is in the easterlies, and so most of the interior is a desert. Move it 25 degrees south, and the winds come from the other way. What is now desert would be a vast steppe or forests. Solution: Read a bunch of articles on the Geography of X. This will help you see what is important in real countries/islands. Another solution is to take the map of an existing continent or large island, and modify it a bit. Stretch it here or there, flip it north for south. Do this in an application that has layers. Build up the layers of the real continent (water, forest cover, agriculture, roads, railroads etc) then do your mods. Now turn off most of the layers. But you have those layers later as time passes in your world. Broadly, a wholehearted "yes", from an aesthetic perspective. Nice! Strongly agree with @elemtilas's point 4 - reduce the type size, compensate by kerning more loosely, and consider all caps for some classes of landscape feature. Perhaps also increase the outer glow/halo. The specific point I wanted to mention from a cartographic perspective is that the names for towns/cities would normally be horizontal. Labels for point features normally would be, whereas labels for linear features or areas often follow the line/shape of the feature itself. I bet the fishing in low depth areas is phenomenal, which may change where your cities are. Some will be processing centers where the boats go. You've done well to place all the cites at potential ports (on the coast or along rivers). As for the labeling, I can't tell what those brown circle things are. Some of the names are huge but then I can't read the city names at all (on a 24" monitor!). I'd also add color to indicate terrain and/or elevation and/or population (there are many ways to do it). Unless there is an interesting reason why, the mountains should not drop straight into the ocean on three sides. Typically, mountain ranges become smaller mountains, then hills, then plains, at least on 2 sides. The sense of scale does not fit the features shown. Australia has more than one forest, doesn't it? Add more details and more variety and a proper sense of scale will emerge. The number and distribution of major cities is a question. Australia has few of them because most of the continent is desert. If you look at a place like Europe, China or India, the density of cities is much larger than on your map. Again, there could be a reason for that. And if you don't want to add more names and clutter up the map, just putting symbols on the map to indicate minor cities would be good as well. I disagree with the comments that ask for a road network. On a continent scale, a map would not include roads. I'm finding it hard to believe there wouldn't be any rivers flowing from the mountains into the ocean. Precipitation is generally caused by moisture and lift; your map appears to provide plenty of both. The only explanation I can think of would be if the wind never blows from the ocean into those mountains. That seems unlikely. A minor improvement would be to add a bit more "clumping" of cities here and there, as they're currently quite uniformly distributed. For example, I'd move Cyraza either closer to Pergeira (sister cities, like Minneapolis/St. Paul), tucked into the bay between Tylanes and Vad Ukkok (making a bustling corridor like between San Fransisco and San Jose). As far as fantasy maps go, it's pretty good, though that single forest on an entire Australia -sized continent ruins the sense of scale. And that mountain range adjacent to water up north looks like an edge of a tectonic plate. The entire west coast of Americas is the edge of tectonic plates, see how it doesn't drop straight into the water on ends and rather has peninsulas and series of small islands. Where rivers terminate in the ocean there are usually swamp lands. Many map makers don't include them at this scale, but it's worth noting. The mountain wall in the north would have a dramatic effect on both sides of it. If the prevailing winds blow water from the north, the entire south should be desert (imagine Peru / Chile). From the south, the whole region should be nearly impenetrable rain forest (Brazil). If the prevailing winds are from the east, everything would be desert. Winds out of the west would work best with the Caellan Wildernes, but I think the denseness might be under-exaggerated by the fictional cartographer. Most of the rainfall for the nation would be caught by the foothills and mountains you've described. I suspect most of the eastern part of the map would be extremely dry. Based on that, I think the river around Oltona might not exist, or the confluence of the rivers might more properly form an inland sea between Lina and Volemi. This might explain water getting lifted up and having grasslands in Aerigoth. The rivers are descending from the mountains as if they are sourced from glacial runoff. You mentioned Australia as the example, which is a temperate environment and might mean you do not have glaciers in the mountains. In this case, I think you might not have any major rivers, but instead countless tiny ones (like Brazil). Could be the cartographer is showing the politically important rivers. Or (like northern India) you may have one river major river running along the foothills beneath the mountains picking up all of the runoff. Not the answer you're looking for? Browse other questions tagged reality-check geography map-making names or ask your own question. Could I get some guidance on this map in progress?